(MENAFN - The Conversation) Martial eagles are in rapid decline throughout South Africa and many other parts of their range in sub-Saharan Africa. These declines have been so steep, that this species is now considered vulnerable to extinction. But conservationists still don't have a very good handle on what could be driving these declines across Africa . Suggestions include: habitat loss , deliberate and incidental poisoning , hunting in response to the fear of livestock loss , collisions with power lines and pollution . A recent concern is a reduction in available prey . Unfortunately, our knowledge of what this species preys on is relatively poor. We only really have two South African studies from the 1980's . Scientists use a range of methods to understand what raptors – birds that feed on smaller animals – eat. These include collecting and identifying prey remains from nest sites, inspecting pellets , which are regurgitated balls of indigestible prey parts, watching from hides set up at nests, or using remote technology such as placing camera traps at nests. Scientists can now even analyse the chemical properties, like stable isotopes in feathers to describe the types of prey eaten. These approaches are incredibly valuable in assessing diet. Unfortunately, they present some limitations. Almost all are nest based. This limits them to the breeding season and prey that is brought to – and remains at – the nest. 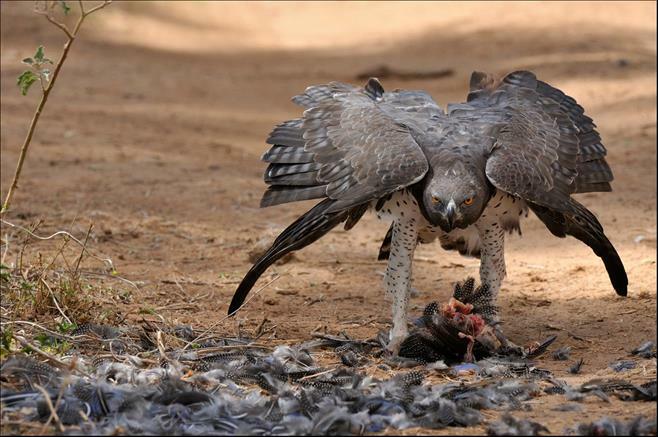 Martial Eagles also nest at really low densities . To get diet data from nests, researchers visit multiple sites in remote places and many times per season. This makes these studies challenging and expensive. Our study used the free web app MORPHIC , developed at the University of Cape Town to search Google Images and catalogue photographs of martial eagles with prey. Our sources included websites, social media and photography platforms.